I am always at a loss when it comes to simple (and inexpensive) Christmas gifts. Not because I don’t know what to give, but because I find 1,000’s of ideas on Pinterest and have a really hard time narrowing it down to just one idea. Don’t get me wrong, I love Pinterest. But, she can be the devil when you’re looking for just one idea and then come away with hundreds. 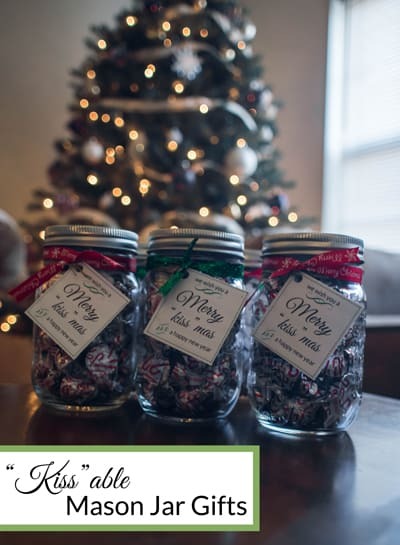 Originally I knew I wanted to do something with mason jars and Hershey kisses (mostly because I found bags of Peppermint Kisses on sale at my grocery store and thought…”I like the cheap stuff. I’ll use that!”). 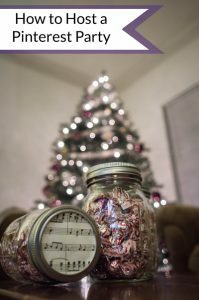 I also knew the jars had to be decorated in a musical manner, since that’s the theme of the house this Christmas. Other than that though, I was out of ideas. 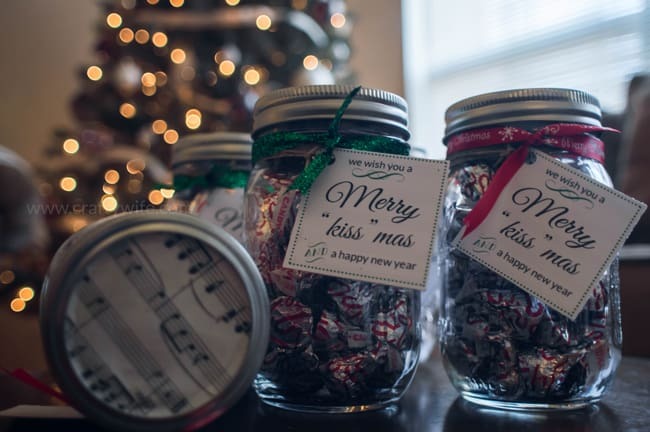 I saw a really cute idea on Pinterest, where they used the song “We Wish You a Merry Christmas” and switched the first part of the word ‘Christmas’ for the word ‘Kiss’. I loved it and knew it was perfect for party favors! 1. Pick out a patterned piece of scrapbook paper and cut it out so that it fits on the top of your mason jar. 2. Hot glue it to the top of your lid (you can try mod podge instead, but that did not work for me!). 3. Fill your jar with candy and screw on the lid. 4. Print out pre-made tags (you can find mine here) or make your own and hole punch them. 5. Attach the tags with jute and then tie a piece of decorative ribbon on top of the jute. Isn’t this such an easy craft? I was pretty thrilled that it took less than 10 minutes to put together since it was the day of the party when I finished them and about an hour before everyone showed up. It’s the perfect gift for a neighbor, teacher, or a friend! Are you looking to throw a Pinterest Party of your own but don’t know where to start? I wrote a post about that! And…If you’re looking for more awesome mason jar crafts, check out my Pinterest board! Follow Teresa @ Crafty Wife’s board Mason Jar Gifts on Pinterest. These are so so cute!! What a great idea!